A windy winter that left huge piles of ice along the shores of Lake Erie took a toll on another part of waterfront life: public docks. Ice combined with high winds that whipped up water during the winter season did more damage than usual at Erie Basin Marina. Some docks have been knocked off their moorings, twisting the wood and steel structures. Three or four of the damaged docks may have to be removed. But city officials, at this point, don't expect the damage to delay the marina's May 1 opening or cost taxpayers extra money. "The wind caused waters to rise really high; and there's obviously ice, as well. So you got ice sloshing around, and the water was really high," said Michael J. Finn, acting commissioner of the city's Department of Public Works. "This has happened before and has been dealt with." Every year, there is some damage to the docks that is repaired at a "minimal cost," said James Marinello, general manager at Smith Boys, which operates the marina for the city. The steel-framed docks are set in place with steel poles that go down into the earth bed, Marinello explained. 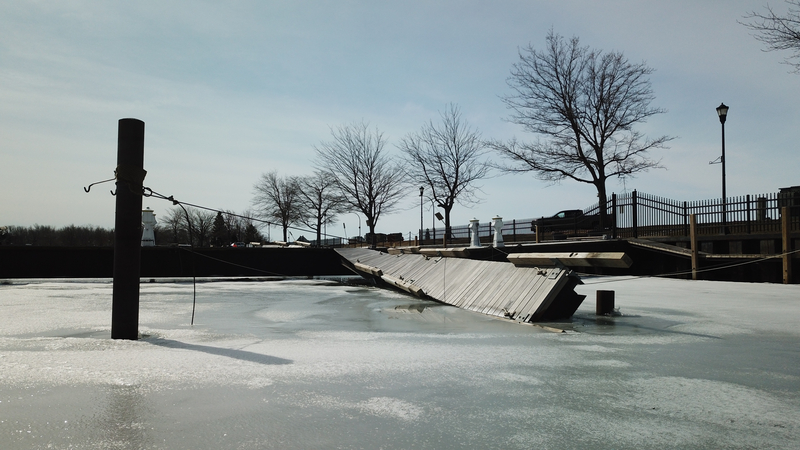 The ice gets underneath the fixed docks, and as the ice comes up, it lifts the docks out of the poles. "Every year we set them back in place," Marinello said. But this year, he said, three or four docks will require "more attention than simply resetting them." "It's nothing we can't handle," said Marinello, noting that dockholders would not be displaced. The City of Buffalo in 2014 awarded a five-year contract with Smith Boys to operate the marina. Finn said the contract requires that repairs are the responsibility of the operators; capital improvements are the city's responsibility. Finn said city officials don't believe the expense of this year's dock repairs will fall to the city. Under the terms of the contract, Smith Boys collects rent from boaters and uses the money to manage the marina, Finn said. The city gets a percentage of the rental fees. Neither Finn nor Marinello has an estimate for the cost of the dock repairs yet. If the work is not completed this month, there will be backup docks for boaters who show up May 1 and discover their slips are not ready, Finn said. Only one of the docks at the marina was designed to be removed during the winter, Finn said. Marinello said city officials have in the past discussed replacing the rest of the docks with removable docks. But they determined that could be more expensive in the long run. "Would it be better? To an extent, yes it would," Marinello said. "The docks have lasted, some since 1974. They're very solid docks. We have very harsh winters." Removable docks, he said, would require more manpower to remove and reinstall every year. 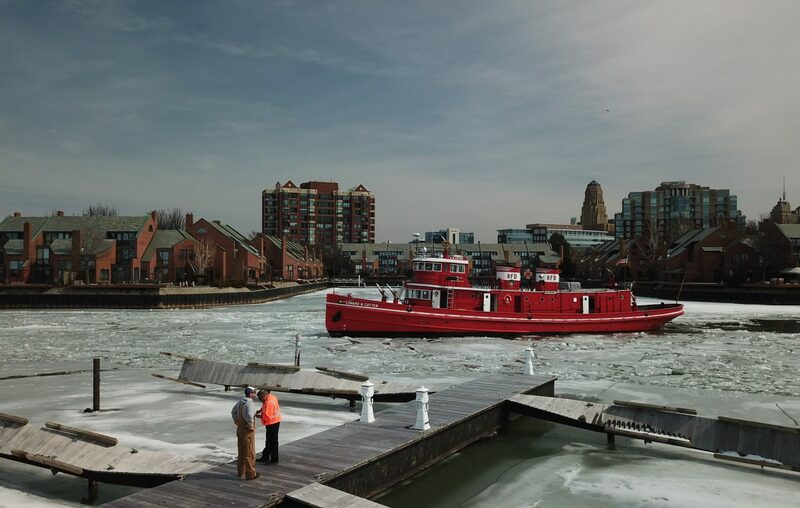 The Buffalo Fire Department's Edward M. Cotter fireboat was at the basin Tuesday breaking up the ice so that Marinello could get equipment and boats in the marina to begin repairs. Meanwhile, the docks at Safe Harbor Marina at Buffalo Harbor State Park fared better this winter, largely due to new year-round docks that were installed in April 2017 as part of Safe Harbor Development's $8 million capital improvement investment into Buffalo Harbor State Park. "There has not been major damage, just all kinds of normal maintenance to get the season started," said Nanette Pease, a dock worker. "The new docks were designed to withstand the area's harsh conditions," said Dan Keefe, a spokesman for the state's Office of Parks, Recreation and Historic Preservation. "And we were pleased with their performance during those extreme weather events."